This is a fun experience in printing “softer” items- the fleshy arms, legs and mantles of octopus. We’ll start by working with small to medium sized market octopus, using a single color, and make a series of prints until we get some impressive prints suitable for turning into a garden scene. 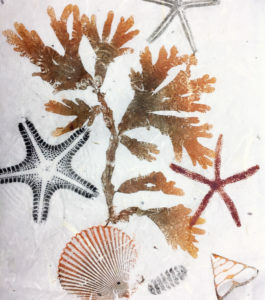 In the second part of the class we will be using lots of color with oil based ink to add seaweed, shells, sea stars and other marine life to our best octopus print (or two or three) to make a true “Octopus Garden”, embellished with your choice of seaweeds and other marine life. . We will be using oil based ink on beautiful asian rice papers. 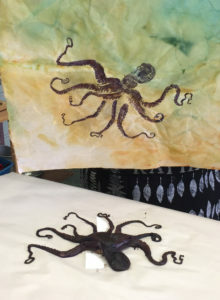 You will also be able to make pure octopus prints on some heavier-rag paper. I will be dying some rice papers beforehand so you will have the opportunity to work with a varieties of colors and patterns in the rice paper. 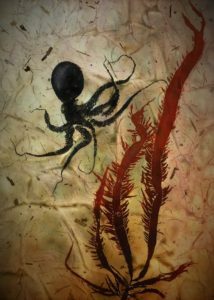 All materials (octopus, shells, sea stars, papers, inks, other marine life) are provided. Please bring lunch and a beverage. To register email fishprint@gmail.com. I mistakenly put the date as Jan 27 on the first iteration, but it is actually Sat Jan 26, 2019.